While you probably don’t want this latest project from the Hasso Plattner Institute to “beam you up” just yet, researchers have created a teleportation machine in that the object you are “sending” is destroyed and then reassembled on a 3D printer. Teleportation, as it’s commonly understood, suggests the movement of one object to another place, perhaps through the disassembly and reassembly of atoms or other similarly impossible means. This project teleports items by scanning them layer by layer and then grinding them away. The scan is then sent securely to another 3D printer which recreates the object in plastic. This means you could, say, put a collectable figurine on one printer, watch it get ground away, and then pick up a nearly exact copy at another location. There would be only one copy of the object as the data transferred between machines is quickly destroyed once the object is printed. The system uses a pair of 3D printers. 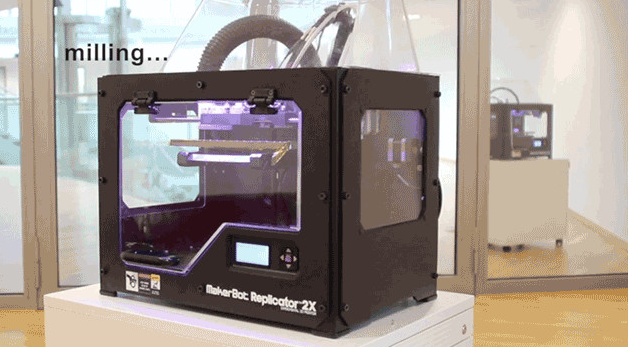 However, one of the printers is outfitted with a small motor and grinding head and scanner and the other is connected to a Raspberry Pi and receives encrypted messages from the first printer. Called Scotty – yes, Scotty – the project is a proof-of-concept and artistic statement rather than a flesh and blood teleporter. “Scotty is different from previous systems that copy physical objects, as its destruction and encryption mechanism guarantees that only one copy of the object exists at a time,” writes researcher Stefanie Mueller. While it’s obviously quite destructive, how else are we supposed to teleport things from place to place without suffering from a physical paradox?